I've written before about being a series addict and the signs and side effects of series addiction. So, I had no problem thinking of series I want to start. I limited my list to books published within the last two years (with one from 2011) or that will soon be published. But there are a lot more series I plan to read. If only I had the time! I've got so much love for The Boleyn Trilogy, you don't even understand. DO THIS ONE FIRST. LET IT RIP YOUR HEART APART! Kiss of Deception made my list too! I've heard so many amazing things about it. Legend! Hands down, my favorite dystopian series. I'm also dying to read Red Queen and of course, anything by Sarah J. Maas you'll find me drooling over. So I hadn't heard of The Storyspinner before, but it sounds fantastic! I'm also very excited for A Court of Thorns and Roses and Red Queen to be released. Scarlet and Maid of Secrets are two books I've also been meaning to get to...gotta love historical-inspired fiction! I think the Legend series is the perfect sort of binge series. (And one that gets better as it continues.) I hope you're able to get to some of these soon, Hannah! Some of these are new to me! But I would definitely start with those that are already finished like Legend, because you still have time to catch with the others and avoid a bit longer the dreaded wait for the next book. I have to admit the Boleyn King, Scarlet and Maid of Secrets (especially this one!) caught my eye and now I'm very intrigued. Maybe start with one of those and let us know what you think, :)! It is always very exciting to start a new series so either way you choose to go I hope you get to read it soon! Yes, definitely time to start the Legend series, friend! I hadn't heard of The Storyspinner but it sounds really cool. I'm also SO excited for A Court of Thorns and Roses and The Bone Season has been on my TBR for two years now. I have read Scarlet and LOVED it (finished it in one sitting on Boxing Day last year). I would encourage you to try it soon, as it's a pretty low time commitment but is really awesome! P.S. !!!! 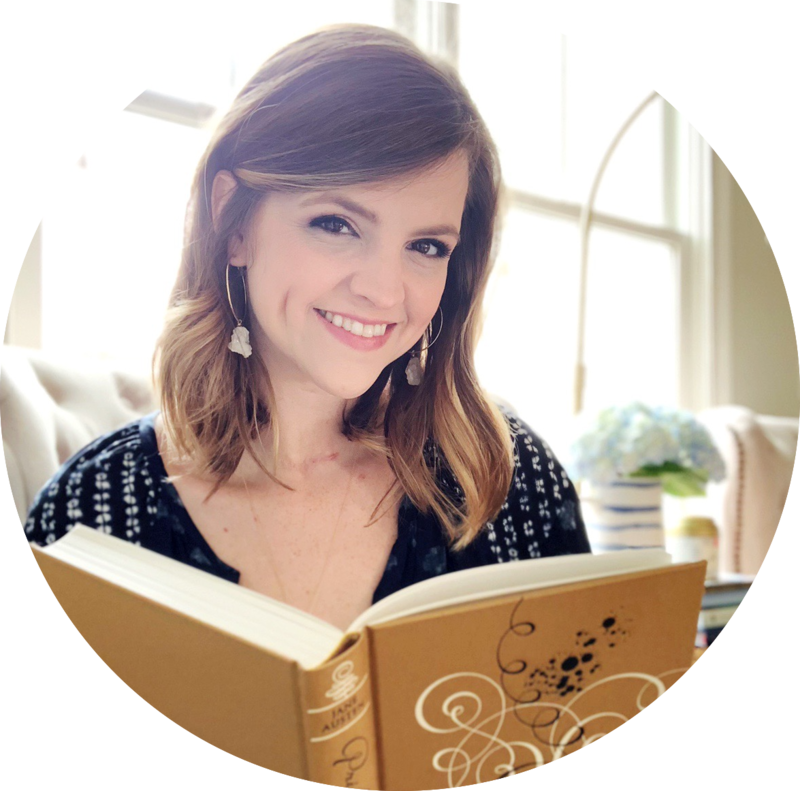 Just saw your "The Re-Read Challenge" button on your sidebar and am so excited!!!! Can't wait for details. EEEeee I'm so excited for A Court of Thorns and Roses! LOVE Sarah J. Maas. I just discovered the Maid of Honor series, and I keep seeing it on people's TTT posts...I might have to put it at the top of my list! I've never heard of The Storyspinner; thanks for the Goodreads link! 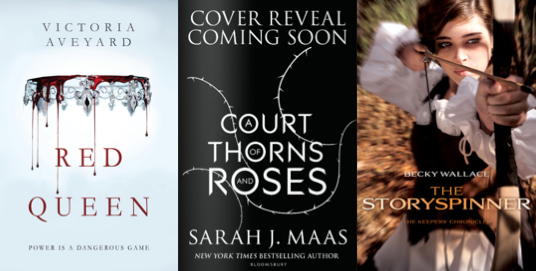 I CAN'T WAIT for A Court of Thorns and Roses, The Storyspinner and The Red Queen! Next year is going to be a great year for fantasy! Scarlet and The Kiss of Deception were both really good! I hope you enjoy them! The first three: YES, DYING TO READ THEM. 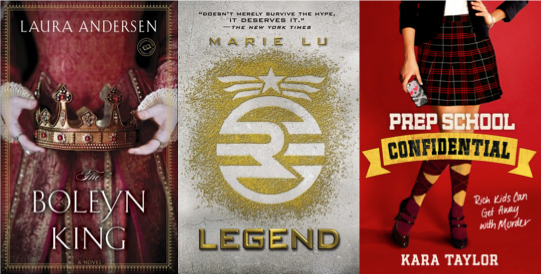 I'm so happy to see Scarlet and Maid of Secrets on so many lists this week!! They're both really fantastic historical YA that I think you'd like. Such great characters. 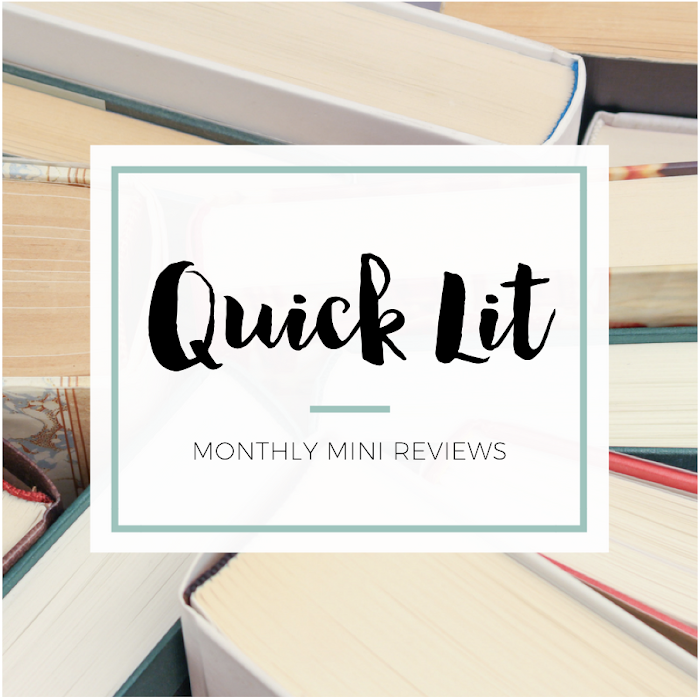 I wrote a review for Maid of Deception recently, it was just as good as the first! I'd be really curious on your thoughts for The Bone Season. It is DENSE. If you can get past the first 50-100 pages, you're golden. It's fascinating but a lot of information to take in. I ended up really enjoying it but you definitely have to concentrate haha. LOVE The Boleyn King!!!! Love. Such a fantastic series. The thing I like most is that it reads like "normal" historical fiction albeit with an alternate timeline. It was so easy to get sucked into the world of these characters that I wished were real. The character development is crazy good too and the mystery is pretty complex. I too really need to start the Legend series.